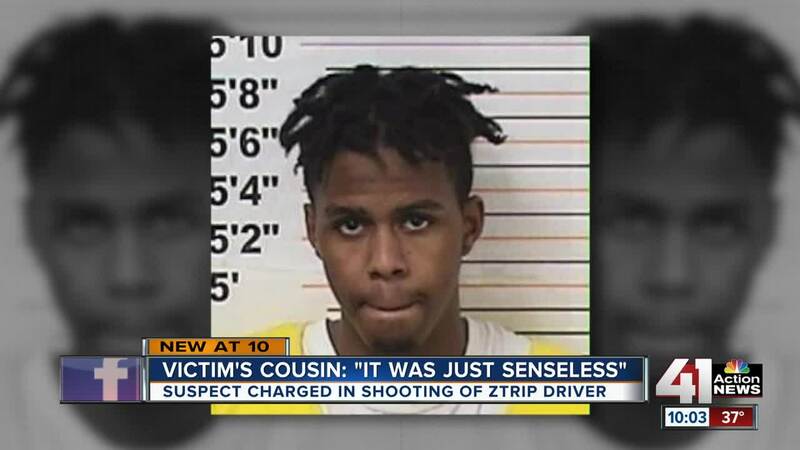 An 18-year-old Kansas City man is facing federal charges in the shooting of a driver for zTrip taxi service earlier this month. Derron D. Nevels is charged with interference with commerce by threats, violence or robbery and with using a firearm during a crime of violence. At about 8:35 p.m. on Dec. 4, the victim was found in the 900 block of Benton Boulevard suffering from approximately 20 gunshot wounds to her upper body, police said. Family members identified the shooting victim as 53-year-old Teresa Meitl. Following the arrest announcement, Meitl’s cousin spoke to 41 Action News about her reaction to police catching Nevels. Aponte said she spoke to Meitl over the phone as she continued to recover from the shooting. The crime led to Meitl being treated in the intensive care unit with severe injuries. According to court documents, the vehicle's surveillance footage showed the driver picking up the suspect shortly after 8 p.m. Once arriving at their destination, the suspect told the driver he was waiting for someone to come out with cab fare. At about 8:15 p.m., surveillance footage showed a second suspect opening a door of the taxi and speaking to the first suspect. Timothy Garrison, U.S. Attorney, Western District of Missouri, called it an ambush. He said Meitl was talking with Nevels about her grandchildren and the cold weather when she was shot multiple times. "From the backseat, Nevels aimed a 22 caliber rifle at his driver's head and held his cell phone in his left hand apparently trying to film, trying to document his crime," said Garrison. Surveillance footage allegedly showed Nevels putting the long rifle to the victim's head and demand she give him everything. The victim grabbed onto the rifle, and a struggle ensued. The second suspect then began attacking the victim and she let go of the weapon. The first suspect then allegedly fired approximately 21 shots at close range. Both suspects fled the scene northbound after the shooting. Several minutes later, another person can be seen on the taxi's surveillance video opening the rear door and asking if the driver is ok and if she called the police. The person then takes a cellphone from the back seat and leaves. Court documents state that officials believe that person was the alleged shooter returning to retrieve his phone. Investigators later determined a cellphone connected to Nevels was used to call the cab. He was arrested Monday and interviewed by investigators. According to court documents, he changed his story several times about his knowledge of the robbery but eventually admitted his gun was used in the shooting. At the time of his arrest, Nevels was found carrying a rifle that investigators said appeared to be consistent with the one used in the zTrip shooting. As her cousin remains at the hospital, Aponte has organized a GoFundMe to help pay for Meitl’s medical costs. So far, she has raised over $1,500.